ADVISORY: Suspect Michael Pletz, 49, of Saugus was arrested by the Crime Impact Team (CIT) on Monday, December 17, 2018 on outstanding warrants. During the team's investigation, it was discovered that Pletz was responsible for fuel theft in the Valencia Industrial Center area. Pletz was allegedly siphoning fuel from gas tanks of vehicles. The CIT team is seeking additional victims of fuel theft from vehicles belonging to local businesses. 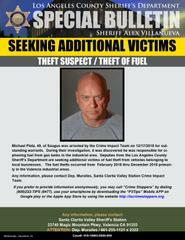 The fuel thefts occurred between February 2018 to December 2018, primarily in the Valencia Industrial Center area. Victims are asked to contact Deputy Muralles of the Santa Clarita Valley Sheriff's Station at 661-255-1121 ext. 2322. Deputies have been actively seeking out individuals believed to have been responsible for thefts in the Santa Clarita Valley. Some of the perpetrators are local, while others are coming from out-of-the-area. Working together with residents and businesses, deputies have been successful in identifying many 'local thieves.' Deputies have been briefed with the information, and advised to be 'on the watch' should they encounter them on patrol. See something, say something. Anonymous tips may relayed to "Crime Stoppers" by calling 1-800-222-TIPS (8477) or through www.lacrimestoppers.org.